Scientists have developed a room-temperature liquid metal-based super-stretchable sensor, with the advantages of facile fabrication, low cost, great stretchability, high repeatability and a GF (gauge factor) as great as 4.95. The new device potentially takes liquid metal-based sensors to the next stage. The findings were published in Scientific Reports. The research was conducted by a team led by Prof. WANG Lei at the Shenzhen Institutes of Advanced Technology (SIAT) of the Chinese Academy of Sciences. 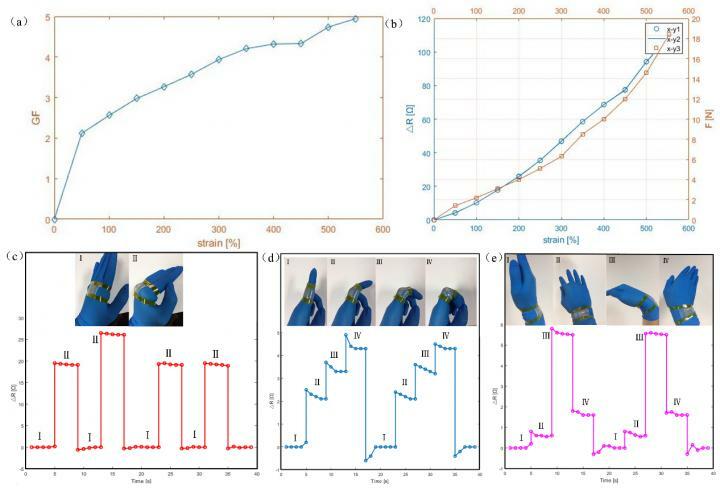 Flexible strain sensors have become a key research area in the development of intelligent devices and especially in wearable medical and robotic applications. Such sensors have broad prospects in human-computer interaction systems and electronic skin and human motion behavior monitoring systems. The important performance parameters for strain sensors include stretchability, sensitivity, stability, reliability and comfort. In order to achieve the best performance, Prof. WANG and his colleagues proposed optimizing the microchannel structures by finite element analysis (FEA). They then designed and fabricated the sensor accordingly. Experimental results revealed that the sensor could be stretched to 550% of its original length, twisted 270o, and bent 180o. GF reached as high as 4.95 when strain reached 550% and the repeatability error rate was less than 0.1%. researchers used the sensor to conduct precision detection of joint, finger and wrist motion, achieving excellent performance. Their results showed the great potential for application of the sensor to flexible wearable electronic devices.